I've been a little quiet here, haven't I? It's because my knitting needles have been knitting up a virtual storm for the whole of the month of September. (There has been marking too - way too much marking but let's not dwell on unpleasantness shall we?). September was COM again (Cast on Month). The idea is to cast on a new object everyday.... Now this could be a very scary proposition. Just take a moment to visualise. At the end of the month, you could end up with 30 new cast ons all only a few rows long, a pile of WIPs and no knitting needles / crochet hooks left to use. Any cast on stitches count as a new cast on. This means any piece of a garment or a toy counts as a new cast on. Picking up stitches is the equivalent to a cast on. So neckbands, edgings, etc... are all separate cast ons. Using these rules, I used September as a way of tackling half completed and long neglected toys with a few new cast ons just to spice things up. I made it with one new cast on every day from September 2nd (the day I actually realised it was September already) to September 27th when I went interstate for work for the rest of the month. 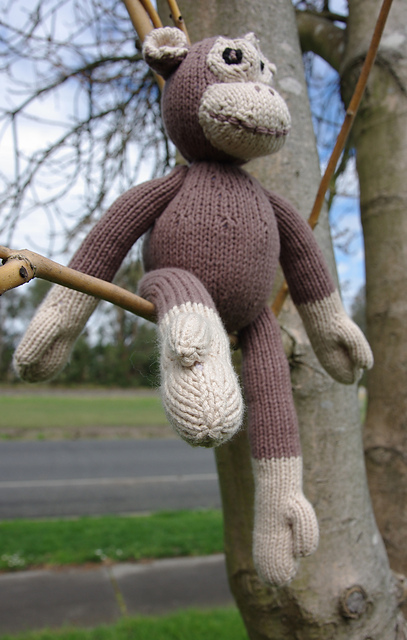 (Unfortunately air travel in Australia means the knitting needles have to get packed in the checked luggage. No knitting on planes). So here's what I have to show for COM. I just recently became a great Aunty. (Gee, that makes me feel old). These are a present for my new great niece. 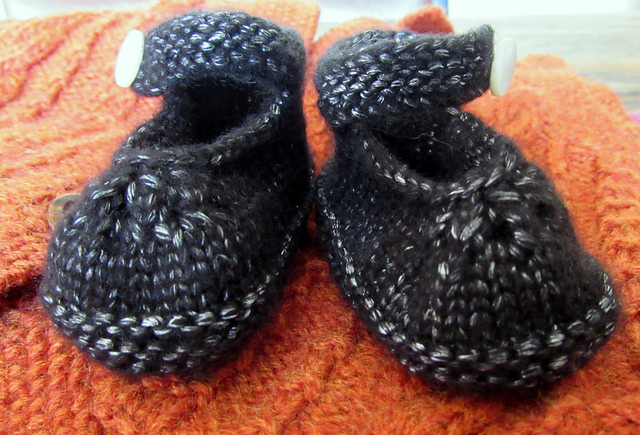 I love these little knitted Mary-Janes and I really love how the silvery shimmer in the black highlights the little floral pattern. The pearly buttons are purely for show. There are hidden press studs underneath to make them easier to take on and off. This is two days of cast on - one cast on for each shoe. This was initially planned to be a present for my niece's Baby shower. I’ve loved this little guy since I first saw him. He is tiny though - much smaller than I first thought he was but just the right size for small little hands to grip. Now I just need to finish it before the 21st of June…. (Well that didn’t happen. I made the body and two legs and got unfaithful with other projects. 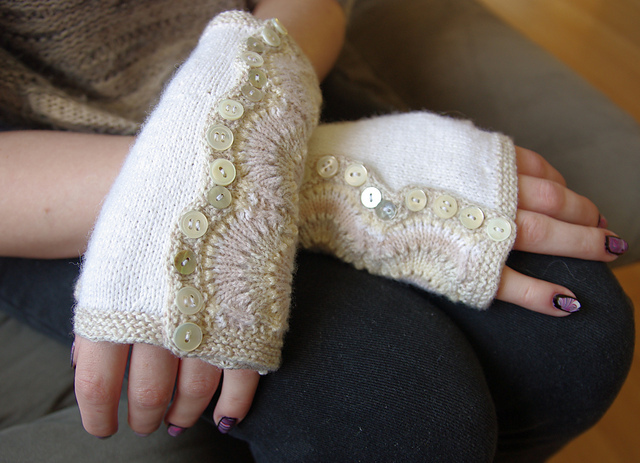 I knuckled down and finished the kid's jumpers instead. My niece got store bought practical basics for the baby shower. The baby was born in late August). I picked this back up in September for VHOC COM. It’s in my rules that if it includes casting on, it’s a new cast on! September 5th: Leg no 4 made. (And Hawthorn won the football final). September 6th: And we have a tail too! September 7th: Blocked legs and tail. Stuffed and sewed up body and one leg. Knitted underside of head. September 8th: Knitted top of head. September 9th: Sewed up and stuffed head and added safety eyes. Knitted all four parts of the ears and sewed them up. Stuffed remaining legs and tail. Sewed legs to lower end of body and attached tail. Sewed ears to head. Now pondering the best way to attach the head and remaining front legs to the top of the body. September 12th: Thanks to my boy we figured out how to best attach the arms (which wasn’t anything like the pattern suggestions). And the head. 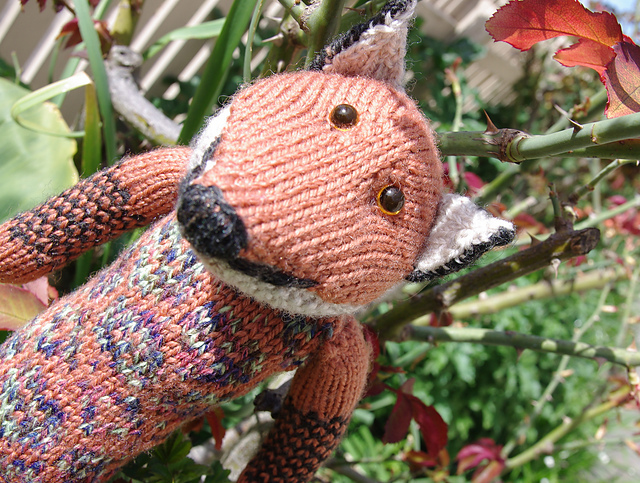 I did end up adding an embroidered nose and mouth after intense consultation with the toy critics (two of the kids). They were attempting to maximize its cuteness factor. 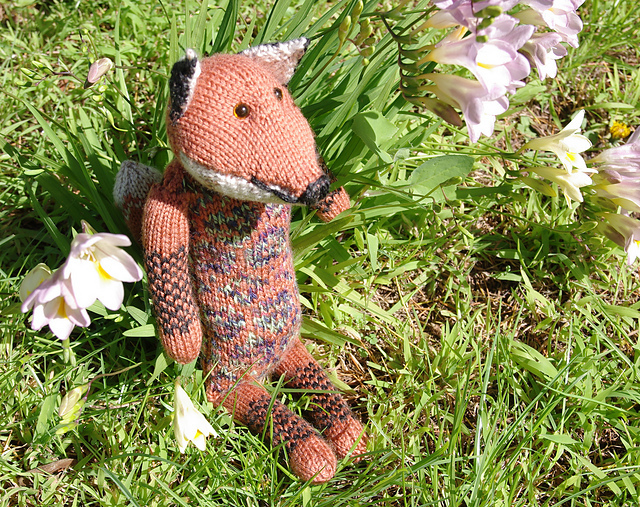 They have decided that the fox is distinctly French and possibly is channeling his inner Basil Brush! Than about 12 months later I discovered that I had already made and stuffed the head and body. It was hiding behind furniture and only found covered in cobwebs when we stripped out the lounge room for major renovations. So I do have enough wool after all… But it’s still hibernating…. 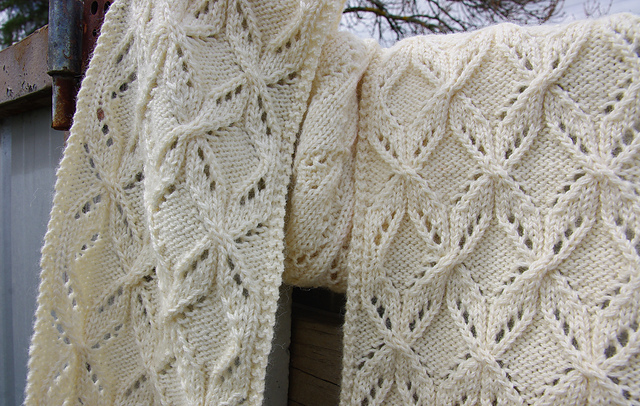 Two separate Ravelry groups have given me the impetus to finally finish this thing in September. 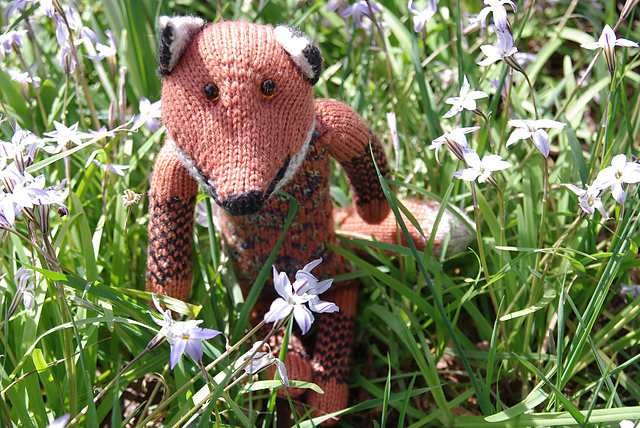 The Unofficial Women’s Weekly Group was having a toy CAL/KAL themed around wild animals. I think Mike qualifies. (He has certainly made me wild enough with his shenanigans so far). And over in VHOC it is Cast On Month (COM) for September - a new cast on each day. Toys fit brilliantly in my interpretation of this. Each new piece qualifies as a new cast on. 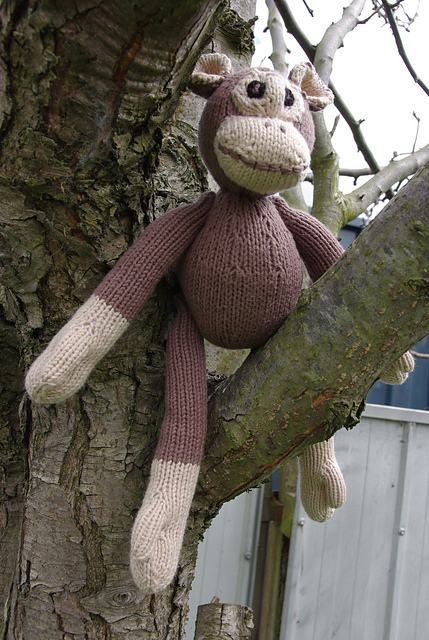 So I’ll knit the last three bits for Mike as part of this - his face and ears. An uncompleted 2014 Ravellenics games project. 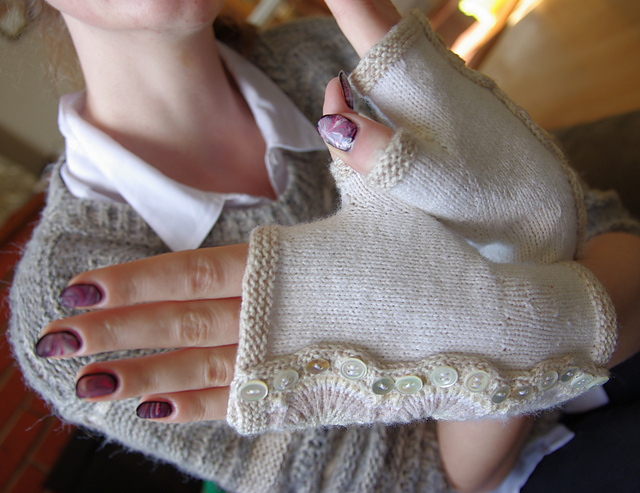 Colouration: fawn / bone / cream white with mismatched shell and pearl buttons from the grandmother button stash. Cast on in car on way to Geelong for stage 1 of the mighty move for the baby to University at the beginning of 2104. Made most on the palm bit in one day. 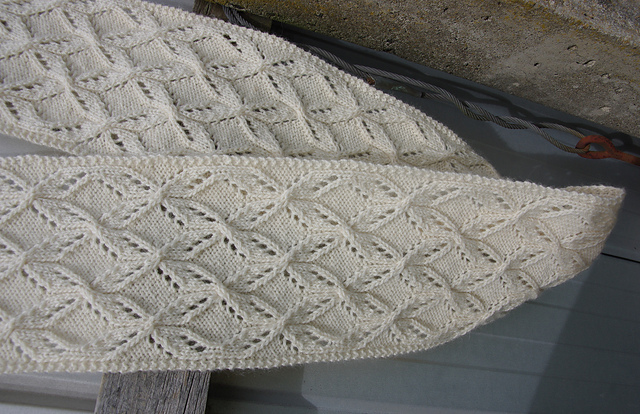 Picked up stitches for the edge and got stuck with the short rows at the beginning of the wave pattern. Shouldn’t try this late at night. Tried again a few days later with a clearer mind. About 4 rows into the flap pattern and my eyes protested. It’s too small for me to see at night easily with my glasses on and the colour changes are very subtle. Not TV watching knitting. It got put to the back-burner and there it has stayed. The games finished. The mitts haven’t. But they won a medal for competing. In honour of the Jamacian Bobsled team. Competing is the essence of the games. We can’t all come first! Picked up again as part of Village Hopelessly Overcommitted September COM. I’ve decided September is about finishing fiddly things. Had completed the first mitt and done about 10 rows on the palm part of the second. I wasn’t really happy with the first one in terms of fit so blocked it. It looks and fits much better now. Completed palm section on second glove on September 9th. Picked up for flap on September 10th (my cast on for the day)….. I basically mirrored the sequence of colours on the other glove. 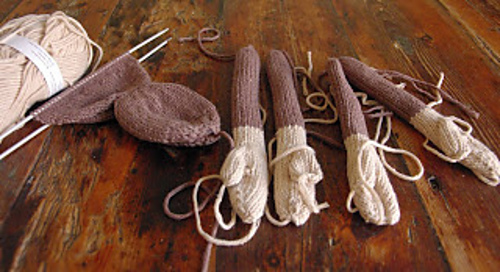 September 11th saw the picking of stitches and completion of the edging for the glove (and I was an extremely virtuous knitter and sewed in all the ends the same evening. September 12 was the thumb and its associated ends. On September 20th whilst watching an extremely exciting Preliminary final (Go Hawks) I painstaking sewed on 28 little tiny buttons. 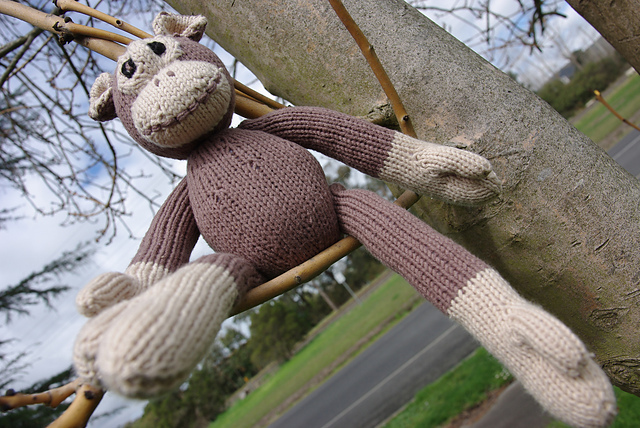 Yarn: 3 ply (Laceweight) pure wool and miscellaneous bits of sockweight yarn in browns and creams. With bonus completion of Twisted Ribbons Scarf for Anyone got cable! scarf-ghan and a cast on of Eagle feathers scarf as the next strip. September was really fantastically productive. This COM thing can work excellently.